It is just right to enter PC bag with the size as I expected. This review is about item#10085643. Since I already have medium size items, I purchased it because I thought it was a compact, somewhat textured material. In the package, "goods corresponding to calibration" and a sticker stuck on it, but for the reasons below, we are disappointed with the product. ① While not measuring anything, the vernier scale should be 0, but it seems that it marks a scale of 0.05. 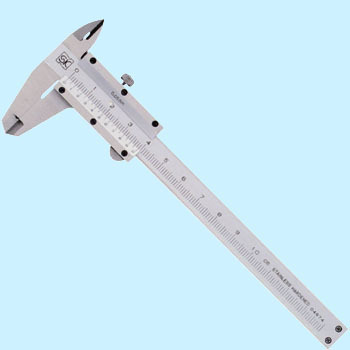 Is this a thing like a caliper with the minimum measurement value of 0.05? ② The tip of the inner diameter measurement side is irregular on the left and right. Although it is speculated, it is impossible to measure the inside diameter of a small diameter of 0.5 mm or less. ③ It seems that metal powder adheres to the product from the time of opening. It is not a pleasant thing with a gritty feeling when sliding a vernier. ④ I purchased it because I wanted domestic products because it was a measuring instrument, but it was not a domestic product. I thought that it was from Niigata, but I bought it. I want the production area to be specified in the catalog. that's all. It compared considerably in the catalog, but it was completely disappointed.